With dedicated 24/7 security, this location offers peace of mind at all hours, creating a safe and inviting atmosphere for employees and guests. 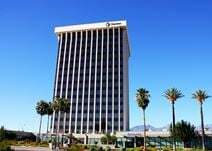 Floor to ceiling windows capture the exclusive view of the city and amazing nearby mountains, make this location ideal for and business looking for something different. With the accessibility to many different amenities, there will never be shortage of options to accommodate needs for both business and pleasure. Situated on the 12th floor of Tuscons tallest building this center provides a landmark address in the heart of the city and access to companies in high-tech industries that the area is renowned. A number of retailers and restaurants are also close by, as is an Amtrak station. The local transport links also offer numerous services throughout the area and make the center easily accessible for both commuters and residents.